Oh, What's the Use! Really! One thing we enjoy in our off-grid life is coming up with ways to re-purpose items to meet our needs. In most cases, it starts with an idea of something we want to build or a problem we want to solve. After mulling it over and discussing it with each other we end up with either a plan we devised together that we think might work, or an idea from one of us that we want to prove will work. Over the past year, we have had many success stories, some that are still in the works, and a few failures. Today, I am going to share a few stories that cover all these scenarios. As I think of some of the random items we have used in interesting manners to fulfill our needs, I realized we have various types. There are those that we have used, thought they were wonderful at the time and then later upgraded to yet a better idea. There are others that we use all over the place as a solution to a myriad of challenges - our go-to accessories to off-grid life. And then there are those that, when we see them we realize they have potential and thus bring them home and find a purpose for them. One day, while at one of our favorite shopping meccas - Harbor Freight, Alan spotted a backpack sprayer that is usually used by lawn care specialists and gardeners to spray liquid fertilizers or insecticides across large areas. Ding! the light bulb above his head lit up. With the 'business end' of the shower enclosure open for easy access, Alan was able to creatively mount the sprayer so that we could operate the pump handle while standing inside the shower. Imagine that, taking a shower was no longer a two-person endeavor. In past posts, you have read how we have had several revisions to our shower and we now have hot, pressurized water that can sometimes be practically unlimited as long as we have had recent rainfalls and the 275 gallon holding tank is not getting low. Despite these extravagant upgrades, we still keep the backpack sprayer attached to the shower stall as it was one of our favorite inventions and can still be used as a back-up if need be. There is a saying that "two is one, and one is none"... always have a backup! I knew I would have to used raised beds for gardening as our mountain property is comprised of rocks (of all sizes) held together with clay as hard as concrete. I built one raised bed last fall because I had picked up some berry bushes on clearance. I started bringing in bags of top soil to fill the bed every time we went to Lowe's or Home Depot. I could not believe the amount of dirt it took to fill that one bed. Over the winter, I started researching alternatives to your typical raised beds and came across wood pallets being used. There are two configurations for this - lay the pallets on the ground, fill with dirt and plant so that the dirt between the slats are the rows. Or, back the pallets with landscape fabric, fill with dirt and then lift them so that they stand nearly upright, leaning them against something so they are at a slight angle. I went with this option since I could rest the top of the pallets against the bottom of our deck, which is several feet off the ground. I felt that by growing the plants at this angle in the dirt, I could grow plants with larger root systems. Since this was experimental, I did not want to put all my eggs in one basket, nor did I want to construct multiple pallet beds if they were not going to work, So I started out with one for this year and planted celery, peppers and carrots in it. The celery died rather quickly, but I had heard celery is difficult to grow, so I was not deterred. To date I have harvested quite a few peppers and some baby carrots. So I consider this experiment a success and plan to build more pallet beds over the winter. One thing I have learned since moving south is that there are many vegetables you can plant twice in the growing season down here. My carrots seemed to be doing well, so I wanted to plant more that would hopefully be ready to harvest by late fall. I still had a packet of 'stubby' carrots, that grow to about 5 inches. Another alternative raised bed idea I had (Ding!) was to use small plastic kiddie pools. There were some on clearance at the local Dollar General so I picked one up, drilled a few holes in the bottom and filled it with a mix of top soil and peat. There were more carrot seeds in the little packet than I thought, because it looks like I have grass growing in the pool, I will need to do some thinning soon. I also had some peas I had not planted this spring (remember the birth of grandbaby #3 meant a trip back to Wisconsin right in the middle of planting season). The seed packet said you could also plant the peas in June or July as a fall vegetable. Well, it was now early August, but the kiddie pools were cheap and I still had more dirt, so I decided to give it a try. I started the peas and some brussels sprouts in planters and then have since transferred the peas to the pool (so much for no peaing in the pool!) and some of the brussels sprouts are now in a plastic tote that a corner had broken on. I had drilled holes in the tote for drainage and we will see how it works as a container garden, double points for re-purposing something that is broken. When it comes time to wash sheets, blankets and throw rugs, I could just bundle them up and haul them off to a laundromat; but that goes against all our off-griddiness. For months, my washing machine was a 5 gallon orange Home Depot bucket. I could only fit in a few pieces of clothing at a time to 'churn', but as long as I did laundry often it was not a problem - except when it came to washing our bedding. After stuffing a sheet into the bucket, there was very little room to add water and definitely no way to get any agitation action with my hand washer (similar to a plunger). complete with colorful plastic frogs. 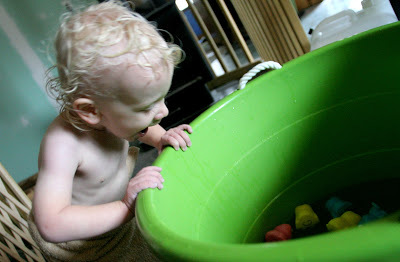 Enter re-using a solution from another problem solved: When our youngest daughter's family was coming to visit last January, I realized we needed a solution for giving our 18 month old grandson baths. He was too big for your typical baby bath tub, and putting enough water in our tub would quickly deplete our water supplies. I remembered the big plastic buckets with rope handles that we had used as toy chests for our kids years ago. One of these would be large enough for Zeke to sit in, and yet would only take a few gallons of water to fill it deep enough for his bath. On our next shopping day, I picked up my idea for a toddler bath tub at Wal-Mart and it worked great for Zeke's bath times in front of the wood burning stove. When our guests left, I realized I could fit a lot more laundry in this large storage bucket than in my current orange 5 gallon washing machine. It does take a bit more water to get it deep enough for adequate agitation, but since our water collection and storage had also improved by then, it was not an issue. However, I still could not bring myself to pour enough of our hard earned water into the tub be able to wash our sheets. You may recall at one time we had been making trips to the car wash to fill our water containers. One morning as I was putting a load of sheets in the tub before heading to church I got another idea (Ding!) - we were stopping at a car wash after church to fill our water bottles, so I decided to throw the tub (with bedding) in the back of the truck. After church, we filled it at the car wash. And, there was an added bonus - the trip home on our road provided lots of agitation! These are basically ideas we want to work on and haven't had the time (or incentive), or projects we have started on but have not perfected. Well, if not perfected at least working half way decently, but we know it is just a matter of time or finding just the right do-dad even if we don't know what that is yet. Alan's idea of relaxing after a long day used to be a long soak in a hot bath. However, that is not congruent with our new life. But once we had full use of our repaired deck, we started thinking about the possibility of a hot tub. There is such a thing as a wood heated hot tub. I know what vision popped into your head just then, but they use a heat exchanger to heat the water, not a stack of burning wood under the actual tub. We are not ready for that endeavor yet, but we did have a nice sized cattle trough sitting empty since our son-in-law had upgraded our bathroom water storage. This spring, Alan made a trip up north with friends that had been visiting and I stayed at the property. He was only going to be gone a couple days and I figured it would be a good test to see how I could handle things on my own. We had massive rain storms almost the entire time he was gone and I was still collecting water in our wide assortment of totes. We had an empty IBC (250 gallon storage tank) we had not put into use yet, that was sitting right below our deck. I was able to empty water from the totes to a bucket and then lean over the deck rail and pour it into the IBC. I collected so much water, I filled the IBC and it was still raining. It was very hard to watch all that water just flowing away since all my totes were again full and I had nowhere else to transfer the water to for storage. Then (Ding!) I remembered the black trough we had to use to store water in for flushing the toilet. We had upgraded to the gravity fed system with the larger IBC tank Grayson had set up for us and the trough was sitting empty behind the house. It needed some cleaning - but, hey! - I had lots of water right now. I scrubbed the sturdy 100 gallon container and moved it up on the deck. It looked sort of like a bath tub sitting on the deck so (Ding-Ding!) 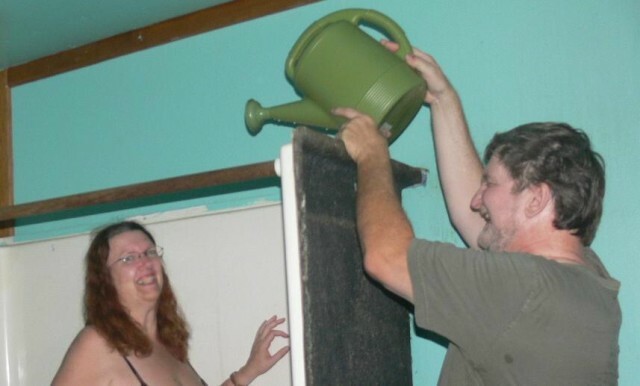 I was going to surprise Alan with a not-so-hot tub when he got back home. The cool-tub worked fairly well for part of the summer, Alan even picked up a small swimming pool filter we could run to clean it. We still need to work on some maintenance issues, and the tub is currently empty but we will probably re-visit this project in the fall. We happened to be at Harbor Freight one day (surprise-surprise) and I saw they had very inexpensive small greenhouses on sale. They are basically a set of metal shelves that have a plastic cover with a door that zips open. I originally got this to use for starting garden plants. I bought it last fall, thinking it would not be used until spring. However, soon after we brought it home Alan thought of another use (Ding!). He painted a couple sturdy plastic gallon jugs black, filled them with water and placed them on the greenhouse shelves. Voila! Warm water waiting for us when we need it. We really didn't use our warm water heater for long because we got the propane water heater for the shower soon after that and Alan plumbed it to be able to heat up jugs of water as well. However, is that another Ding! I hear (Ding! ), I have been experimenting with another use for the greenhouse this summer. With the vegetables ripening, I decided I wanted to start dehydrating most of them. Yes, I love to can, but not when it is over 90 degrees everyday. And besides, dehydrated vegetables will take up a lot less space than canning them. I will be hiding most of the garden produce in soups and stews as Alan claims to be chlorophyll intolerant, so appearance is not a big issue in the final product. With the ambient temperature between 90 and 100 most of the day, I figured the area inside the greenhouse would be warm enough to set up as a dehydrator. After some testing to verify the temperatures, I placed my first rack of tomato slices into my super-sized dehydrator and was looking forward to a batch of sun-dried herbed tomatoes. I forgot to take one thing into consideration - the bottom of the green house is not enclosed. The shelves sit on out deck and the plastic cover slides over the top of the shelves and covers all four sides when zipped, but not the bottom. Flies quickly learned of the opening, and as I did not want to store the dried foods that were fly-leftovers, I tabled this project for a while. This winter I will either perfect my greenhouse food dehydrator, or build a solar dehydrator. For this year, I am using the pilot light in our oven to dehydrate our produce. While I am prepping the food I turn the oven on low for a few minutes to heat it up a bit more that the pilot light does, then shut it off and pop in the trays of food. The trick is to remember to remove the drying foods before preheating the oven for baking, I did end up with one batch of blackened tomatoes. We have a variety of shelving units around the house. Some are more industrial, such as the ones in the utility room which hold many heavy items such as cans of paint and our bottles of filtered water; while others are the cheap plastic pop-together type. However, none of these shelves fit a current need I have for storing my home canned foods and other pantry items. The flaw with all these shelves is the height between the shelves. I want shelves that are spaced more narrowly together, just a bit more height than a quart jar between each shelf. 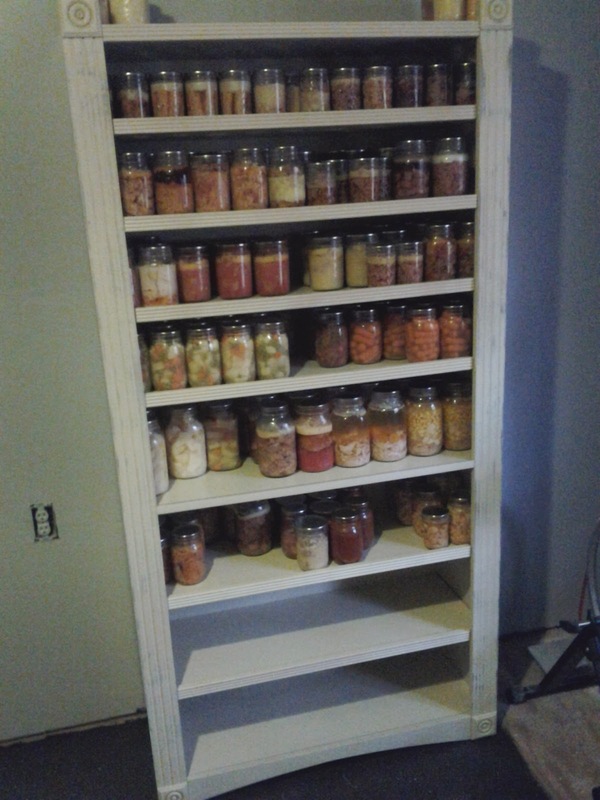 I do not want to double stack my jars on the taller shelves, nor do I want all the wasted space if I put just one level of jars on these shelves. So, I have been on the lookout for an inexpensive way to create the shelves that would be just right for my canning - very sturdy and with closely spaced shelves. be part of a shelving unit. Enter my wood-thingies. We have some close friends down here that we have been spending a lot time with (and it's not because they have air-conditioning). We are very like minded and share a lot of interests and laughs together, and they are much more talented at being resourceful and re-purposing items. One day, as we pulled into their drive, I spotted three stacks of what I started calling 'those wooden thingies' for lack of a better way to describe them. On closer inspection, the first idea to pop into my head (Ding!) was canning shelves. I learned these wood-thingies-of-vast-possibilities were a dumpster find, and I made sure to bring our conversation around to what they were going to use them for, and, more importantly, if they had any to spare. I snagged nine of them with plans already starting to churn in my head as to how to make these the end supports of a sturdy canning shelf unit. I have re-worked them several times in my head, but have as yet failed to remember to actually measure the frames to determine the width I need for the actual shelves. These are the ones we hate to admit to, the ones we should have known were not good ideas. Earlier in this now lengthy blog post, I mentioned that our son-in-law had built a platform that would hold a full IBC tank for a gravity feed water supply to the bathroom. I am sure you have all done the math to determine what this actually entails, and came to the conclusion that when filled the water alone (275 gallons) weighs over a ton. 2289.33925 pounds to be exact if the air temperature is 68 F.
We had another IBC and we decided to elevate it in a similar manner. We wanted it to catch rain off our shed roof and then we would connect it into the utility room for laundry, etc. As we had a pump in the utility room to draw water from this tank, we only wanted to elevate it enough to be able to place a bucket under the spigot so that we could directly drain water from the tank for watering the garden. So, with the platform only needing to be a couple of feet high, and the fact it would not need to hold quite so much weight as this was a 250 gallon tank, Alan got to work on the construction project. One thing Alan will be the first to admit is that he is no carpenter. He is great with plumbing and electrical work, but we both breathed a huge sigh of relief when our son-in-law came down to work on our drywall and deck replacement. But hey, the platform didn't have to look pretty, and we had plenty of scrap lumber to reinforce it and make it sturdy. I was working on other projects inside the house while Alan tackled this one. Every once`in a while you know there is a project that is best not worked on together, and I was pretty sure this would be one of them. I did occasionally check out the door to see how it was going, especially if I hadn't heard any hammering or muttering in a while. In a surprisingly short time, the platform was in place and the empty IBC was on it. While our bathroom IBC is cylindrical, this one is a cube, as most of them are. The majority of these large cubes are reinforced by being placed in metal frame cages, but this one had come in a cardboard box, which we had removed - think giant milk jug. ... until water was added. With the tank in place, Alan started transferring water from yet another IBC - the one next to the deck that I had filled from all the totes of rain water. I peeked out the door a few times as the new raised tank was filling and all was going well. When it was full, and Alan shut off the transfer pump, I breathed a sigh of relief. The platform had held and our new tank was ready to provide water to the utility room and our garden. Back to work on my project in the house. About ten minutes later, I heard a loud cracking noise and a ground shaking thud. I raced to the door and saw the new tank was once again on the ground. Surprisingly, it had not ruptured. However, since it was still full, we once again had to transfer all the water back to the tank by the deck so that we could move the fallen tank out of the way to start over. We decided to switch gears and build a platform out of concrete block and a pallet. This worked with almost no mishaps. We once again transferred the water back to the shed tank and with the addition of some rain gutter we were also set to collect rain water from the shed roof. We quickly learned that 10 feet of gutter on the shed did not provide nearly as much water as 10 feet of gutter on the house roof. Don't worry I am not going to get into that geometry problem. So, after all that, we decided to take the now empty IBC sitting next to the deck, move it behind the house, next to the utility room and attach gutter to that section of the roof to fill the tank. Alan used 20 feet of gutter here and in the last rain storm that 250 gallon tank was filled and overflowing within a a couple hours. If you have been reading these posts in the past, you will know I am somewhat obsessed with collecting water. When we started out, we realized keeping up with water consumption was much more difficult than supplying our electricity needs. We originally had to drive out and bring water back to the property. Then we retro-fitted the well on the property so we could draw water from it using a torpedo bucket. Next, we set up rainwater collection systems, which greatly boosted our water supply. Despite always having an adequate water supply, I still feel the need to collect all the water I can, it is so hard to watch water just pour from the roof onto the ground during a rainstorm. This winter, we had several big snow storms - about 2 to 3 inches each time and I had another bright idea (Doink!) All that water was just sitting on our deck, waiting for me to collect it. So, I grabbed some special snow collection tools from the kitchen and started filling containers with the snow from the deck rails as I assumed it would be cleaner than snow from the deck itself. I dragged the snow-filled totes back into the utility room and waited for the snow to melt to add to our water stores. Boy was I disappointed, depending on the 'fluffiness' of snow, it can take about 10 inches of snow to equal one inch of water. All those totes of snow I collected produced maybe a couple gallons of water. And, FYI, falling snow is dirtier than you would think. This was my first time gardening in a long, long time. That and the fact that we have no dirt on our property means there was a lot of trial and error this year. My original plan was to use a flower bed that was already in place as my main garden for this year. After digging up hundreds of rogue flower bulbs from the plot, and ignoring all the rocks I was hitting, I was ready to start planting. I had started a lot of seedling indoors and was in the process of transferring them to the garden plot. This is a small plot that was quickly filling up. I had some acorn squash plants that needed to be transplanted, but I was worried their vines would take over everything if I added a row of them to the garden plot. The area we had fenced off to keep the deer from the garden was larger than the garden itself, so I decided to put the squash in containers along the inside of the fence. 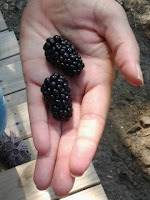 They would be a couple feet from the other garden crops and would also be able to vine up the fence we had constructed. All I needed were containers. (Doink!) I had some sand buckets that I had used to anchor the garden flag stakes I had used for my birdhouse display (another not-so-good idea because they were top-heavy even with rocks in the little buckets). As the metal stakes had punched through the bottoms of most of the plastic buckets, they were already set with drainage holes. I added top soil to the buckets and transplanted my happy little squashlings. And they grew great.... for about a month and a half. Then all growth stopped. I was basically practicing root-binding, like the tradition of Chines foot-binding, but with plants. Alan did not seem very upset with my failed squash crop, I guess the green on the outside of squash constitutes chlorophyll intolerance. Needless to say, I will be visiting the farmer's market for acorn squash this year. And that covers all the Not-So-Good Ideas.... When I started thinking about this section, I was hard-pressed for any failures to share. I am sure this dilemma was not because we had no failures, but because we so quickly forget them and move on to what we hope is a better idea. Hmmm, a platform for an IBC made from wooden-thingies and zip ties. Add a bit of duck tape and voila... CRASH! Our peaceful mountain home now has a war being waged right outside it's doors. What started with a few pesky interlopers has quickly escalated to stealthy, nightly attacks that are robbing us of sleep and sanity. As you may recall, last fall we started putting out bird feeders and over the winter we were very pleased with the variety and volume of birds that visited on a regular basis. We occasionally had some other woodland critters come around and help themselves to the bird feeders, namely squirrels and deer. The squirrels were entertaining enough that we did not mind (too much) that they spent hours each day dangling from the feeders as they picked through to get the choice seeds and dropped the rest on the ground. We have several bird species that prefer eating from the ground, so the seeds tossed out by the squirrels did not go to waste. When the deer first appeared, we were so excited to have them visiting our yard each evening, we did not mind that they were quickly emptying any of the bird feeders within their reach. However, after they broke one feeder, and then gnawed away at wood on it's replacement, we decided it was time to re-locate some of the feeders. Little did we know that this decision would, while eliminating these little skirmishes, lead to all out war on another front. First, we decided to remove any bird feeders from being within reach of the deer. We did provide the deer with a seed block, so they did not seem to mind the loss of the feeders to much. We had been hanging a couple feeders from wrought iron shepherd hooks, the style generally used for hanging flower basket. The deer (and squirrels) could access these quite easily, so we stopped using them and attached a curved hook onto a tree trunk, at a height that the deer could not reach. With this move, we vanquished the deer, but the squirrels continued to offer them aid by knocking seed to the ground so that the deer could forage. The squirrels also became demolition experts in that they would pull apart and/or chew off sections of the plastic feeders so that the seed would pour out onto the ground. Needless to say, we preformed hardware upgrades, replacing the plastic feeders with squirrel teeth resistant metal versions. When we moved onto the property, there was an old basketball hoop attached to a length of 2x4 that was in turn screwed into a tree along the driveway. As neither Alan or I are know for our prowess on the basketball court, the hoop was repurposed into yet another bird feeder stand. Alan fashioned a rope and hooks into a pulley system for raising and lowering the feeder to fill it. All out war was instigated by new visitors (aka the enemy)... raccoons. We had not seen any raccoons on the property all winter, but this spring and summer several things changed that probably played crucial roles in bringing the enemy to our door. First, I planted a garden. When I put tomato plants in containers on our deck, I quickly realized I needed to surround them with chicken wire as some type of 'critter' was digging them up at night. 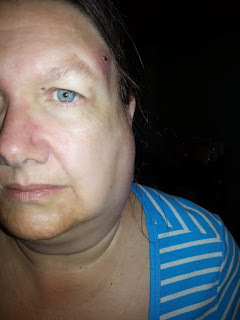 Next, one day as I was filling the basketball hoop bird feeder, the cross-timber gave way from the tree and the feeder, hoop and 2x4 came crashing down... on my head! The final impetus to our soon to be declaration of war was the lack of birth control within the raccoon community. Early in the summer, Alan would go out on the deck at night, shine a flashlight up into the tree branches, and there would be several cute baby raccoons staring back at him. Fast forward a couple months and those nocturnal critters of destruction are no longer cute, and no longer up in the trees. When the basketball hoop feeder exploded (I think it was squirrel sabotage), we decided we needed to tighten our perimeter and move the feeders to more secure locations within 'friendly territory'. The enemy lines were encroaching upon us. We crossed into enemy territory during the light of day, rescued the feeders and brought them up to the deck. We had prepared the retreat location by mounting hooks into the deck railing and we hung the bird feeders there. Close to the house and about 10 feet off the ground. However, within just a night or two, we started hearing footfalls across our deck on a nightly basis. One night, as I was sitting on the sofa, I looked through the office to the sliding glass door and saw the enemy staring in at me! The raccoons were not deterred by our proximity to the newly relocated bird feeders. We would sit at the living room windows, just six or so feet from the feeders hanging on the deck railing and watch the raccoons attack them. One night, while laying in bed, I heard a large crash and the next morning found one of the feeders laying on the ground. Time for new war-time strategies. Since proximity to us did not deter the enemy, we decided we needed to hang the feeders in a manner to keep the raccoons from being able to reach them. Our plan was to extend them out away from the deck in some manner so that the pesky critters could not get to them. We made a supply run to Lowe's and I came up with an idea using conduit, a section of larger pipe and various hooks and clamps to make retracting poles so that we could still easily fill the feeders and then slide them out of reach of the raccoons. This deterrent worked for a couple days, while the enemy also strategized, and then we were once again waking up to empty bird feeders, and worse yet, damaged feeders that had plummeted once more to the ground. We were not yet ready to surrender, so back to the drawing board. The weight of the full bird feeders was causing the lengths of conduit to bend downward (even before the weight of the raccoon was added to it each night). We decided engineering an upward slant to the conduit would do the trick. We assumed the raccoons would not be able to climb up a sloping steel rod. Alan cut small wedges of lumber and inserted them between the deck rail and the conduit. That night, we went to bed confident we would wake up to birds happily having breakfast, not screaming at us because the feeders were once again empty. Again we had success for a couple days, but then the enemy once again foiled our plans in some way. I suggested we grease the poles, so Alan then applied lithium grease. And yes, we were grinning evilly as we sprayed the lubricant on the poles as thoughts of raccoons slip-sliding and plummeting to the ground raced through our minds. The next day, the raccoons left us a visual comment as to what they thought of our last escalation in the war of the bird feeders. In fact, I almost stepped in their 'comment' as I opened the french doors and stepped on the deck the next morning. At this point, we truly believed we had won not only that battle, but the entire war. For several days we woke up to feeders that still had a seed supply, despite the sound of the pitter-patter of raccoon feet on the deck during the night. However, the enemy is persistent and apparently lithium grease dissipates (or possible raccoons licked it off) because after about a week, we once again woke up to empty bird feeders. At this point, I fear we may have reached the point of loosing a bit of our sanity. We are now determined to stop the raccoons at all cost. Alan brought out the big guns (no, not literally as I am not prepared to try raccoon stew ...yet). Out came strips of lumber, power driver and nails. We have now created one more line of defense on the deck railing. So far, this has been a bloodless war, although I had feared I would wake up to bloody paw prints on the deck after our last reinforcements. If this has not convinced the enemy to surrender, the pellet gun may be the next item in the arsenal against this formidable foe. will leave a 'comment' to this? Alan and I used to be avid golfers, a few summers ago we played at least 36 holes per week. Mini-golf that is. One of my few claims to 'fame' was that I was once asked to join the United State's International Mini-Golf Team to compete in Italy. Unfortunately, no companies feel they would benefit from sponsoring a mini-golf all-star, so I declined the invitation as I would have to finance the trip myself. 1. Combiner box for the solar system. 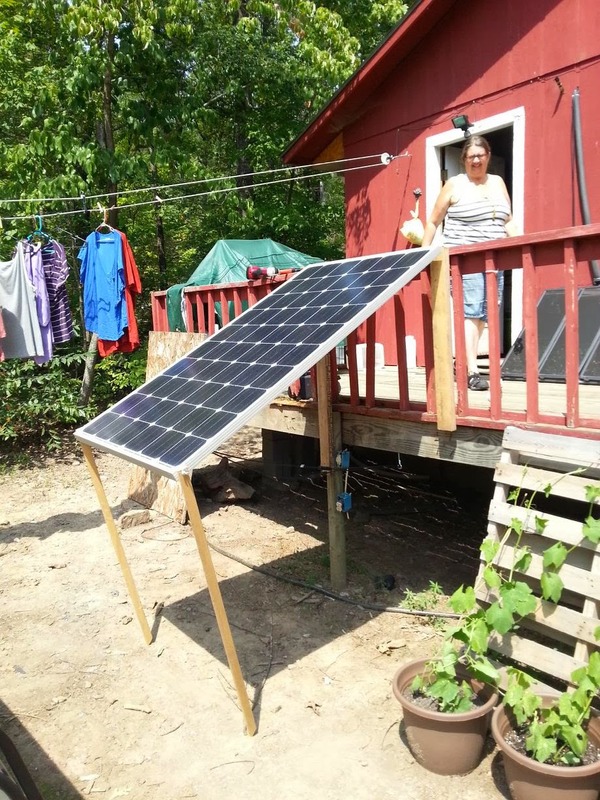 Alan built a new gadget to go between our solar panels and the charge controller. As the trees leafed out this spring, we felt we were loosing some power when all the panels were not in full sun. In the morning, as the sun rises over the mountain, the trees in our yard block the sun from the eastern most panels on the deck and these panels do not get full sun until about noon. And then, as the sun crosses the sky and starts to dip to the western mountain, the trees on that side cast shade on the western panels. When panels were in the shade they were draining power from the sun soaked panels, so some of the power was not making it to our batteries.The combiner box contains diodes that isolate each panels so the shaded panels can not become parasites stealing our power. We have seen our peak power production climb from 13.1 amps up to 15.2 amps, a nice improvement! Alan plans on posting an article on his project soon. bathroom tank can bee seen behind it. 2. Rain water collection. We moved our second IBC tank, the one that had collapsed when we placed it on concrete blocks next to the shed. We now have it behind the house, just outside the utility room. We put up 20 feet of rain gutter on this side of the roof to feed into the tank. This catches water from twice as much roof area as the 10 foot gutter we have feeding our bathroom tank. We had one torrential rain storm soon after setting up this new tank and the water just gushed in from the 20 foot expanse and the 250 gallon tanked filled in just that one storm. 3. Automatic watering system. 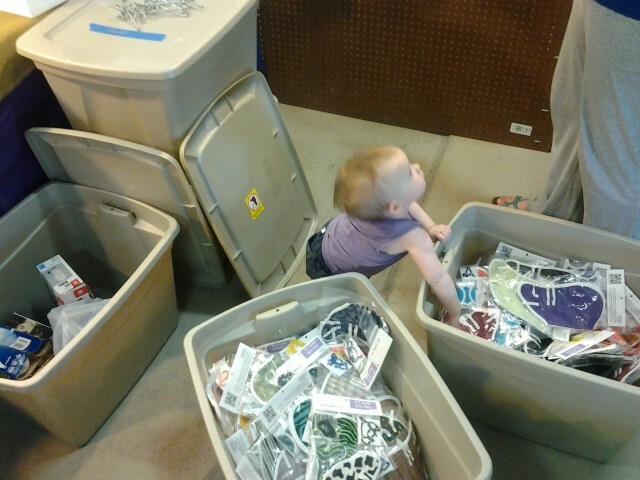 When we were last up north, Alan went to one of our favorite stores, American Science Surplus, while I helped our daughter with the grandbabies. He went there just to browse for any sciency stuff that might be useful on the property. American Science Surplus has lots of science related items, electronics, etc. One of the treasures he picked up was a timer he could connect into our water system. That, plus a drip hose created an automatic waterer for our pallet and container gardens while we were in Kentucky for about a week.We were able to set the timer so that the drip system watered the plants for 15 minutes twice a day while we were gone. We also had to make sure the water tank was full before we left, we did not want to run the tank dry watering, because then the pump would burn out as it kept trying to pump water but sucked air instead. So, we made a trip to the spring to fill our third IBC tank which we keep in Hoss, our larger pick up truck. We then use a 12v transfer pump to move water from the truck to the house tank. Whether we are adding rain water or spring water, we always treat the water we store in the tanks and then further filter all the water used for consumption. Last summer we left the property for an extended period to partake in several events that all occurred within the same time frame: our grandson's first birthday, helping our daughter with an annual event in Kentucky that she could not attend due to being 9 months pregnant, and then the birth of said grandaughter. The four days without internet was due to the fact that Alan and I were so busy with our daughter's booth at the event in Kentucky I was exhausted each night and never turned my computer on. It is sort of ironic, that whenever we have a need to travel and be back on the grid is when I slack off on my internet usage. This year, the events were similar, but a little more spread out. We traveled to Wisconsin in May for the birth of our third grandchild, but then we came back south before heading out to Kentucky once more for the annual sales event. This year was even more fun than usual helping out our older daughter with this event because she was able to attend it with us this year, along with her husband and their daughter. So, while we had four people working the booth this year instead of two, and thus I was not exhausted each night, I still did not use the internet much because I was too busy playing with our granddaughter. Some projects around the house seem to take forever to get completed for a variety of reasons. For example some are tiring and time intensive, like cleaning and painting floors. Others we slowly collect what we are looking for before actually beginning the project, like my kitchen cabinet hardware. And others, frankly, are things we don't really want to get started on and usually do not get moving on them until we have a need, like when we were assembling various pieces of furniture, some of which did not get built until January and that was only because guests were arriving and we needed it for the guest room. Do we still have never ending projects and distractions? Always. Right now, my garden is a never ending project. Not so much this year's garden as we are starting to see the fruits (and vegetables) of our labors, but my plans for next year's garden. As I am seeing the results of our various garden experiments, I am already getting excited about what I want to accomplish in next year's garden. In fact, last night I was up late checking out seed company web sites and have already bookmarked various tomatoes and squash I want to grow next year. I also purchased large pots yesterday that were on clearance ($7.99 marked down to $1.99) to expand my container garden next year. In fact, with the longer growing season down here, I am hoping to plant some fall garden items this week. One of my distractions I wrote about last year, was a jigsaw puzzle I had started that kept me up late at night. I can easily become obsessed with completing a puzzle, so I have not started another since that one. That is, until four nights ago. 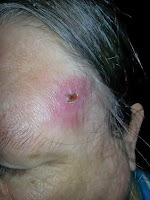 Alan has been having some shoulder pain the last few weeks and last Friday he woke to excruciating pain. Bad enough that he decided it was time for to get it looked at. Turns out, according to the doctor, you should never sleep with a fan blowing directly on you and Alan had been doing just that. We had been having a bit of a heat wave and every night it was still over 80 degrees when we went to bed. Alan set up a fan in the bedroom window that is right at our headboard, which is decorative wrought iron style and thus open to let the fan blow through, right onto his shoulder. Since (1) the fan which is about 8 inches in diameter, is positioned at the center of the headboard and (2) I did not suffer any ill-effects of a night breeze hitting me and (3) it is his right shoulder that is in pain and he supposedly sleeps on the right side of the bed; I take that as proof that Alan sleeps in the center of the bed. Wow, was that a digression from the topic, I had simply meant to explain that Alan has been on pain meds and going to sleep early, so I have once again opened the beckoning jigsaw puzzles. I started with an simple 350 pieces puzzle, to get them out of my system once again. But their deceptive pull was too strong, I finished that one in two nights and quickly escalated to a 500 piece puzzle which I again blew through in just two nights. So, while my husband is on pain pills, I am struggling with my addiction. There is a 2000 piece puzzle sitting on the shelf, and worse yet, the picture is composed of dozens and dozens of vegetable seed packets. If I start this puzzle, would that mean I was feeding two addictions at once? This post that I made last year was one of my favorites. In it, I listed the various phases we were seeing transpire on the property, most of which involved insects. Katydids, walking sticks, harvestmen (a.k.a.daddy-long-legs), and praying mantis to name a few. This year, were are seeing the same phases to varying degrees. This summer is much wetter than the summer drought we went through last year, so some insects are more prolific this year and others not-so-much. We also had a new phase that we did not have last year - dragonflies. The main variety we saw throughout the spring and early summer were a smaller sized dragonfly with vivid blue wings. There were other species as well, but we had literally dozens of the beautiful blue little dragonflies flitting about the yard. They particularly liked to hang out around Hoss's truck bed. Maybe the black truck emanated some heat during the day that became their spa. They also liked to land on the tips of my tomato stakes in the container garden on our deck. Unfortunately, one of least favorite phases has been greatly extended this year - the tick phase. Fortunately, the tick control we used this year in the yard is working very well, but stray outside that zone and you are virtually guaranteed to find the little buggers on you soon after. Alan walked about 50 feet into the woods south of our deck to place a shooting target and that evening we discovered four ticks had become attached to him in that short trip out of the tick free zone. While the tick phase is lasting much longer this year, end of July and still going strong, one of our favorite phases was much shorter this year. The skink phase. You may recall last year we discovered these cute little lizards with bright blue tails liked to sun bathe on our deck.With our wetter spring, I thought we may even see more skinks than last year, however I forgot to take into consideration one of the additions we made to the household this winter - our cats.We did see one of the cats walking along the deck with a bright blue tail sticking out of it's mouth. This summer, I once again found myself thinking this at one point. In fact, it was the first title from last year that popped into my head for this post. As summer was approaching, the sun was higher in the sky and the power being generated by our solar panels decreased. I did not expect that. As you may recall, last fall as the sun was dipping lower and lower in the western sky, we took down a few trees to open up our southern vista to accommodate our solar array. With spring, the days became longer, and our batteries were being well fed, and then as summer approached, we noticed the incoming power levels were slowly dropping off. The problem was, while the sun was higher in the sky, the trees were leafing out and causing shadows on parts the solar array both in the morning and late afternoon. The amount of time each day where we had full sun on all the panels was actually decreasing as we approached the summer months. The combiner box I talked about earlier helped us retrieve a greater percentage of the power being generated, but we now know that, overall, we generate less power in the summer than in the winter. Go figure! 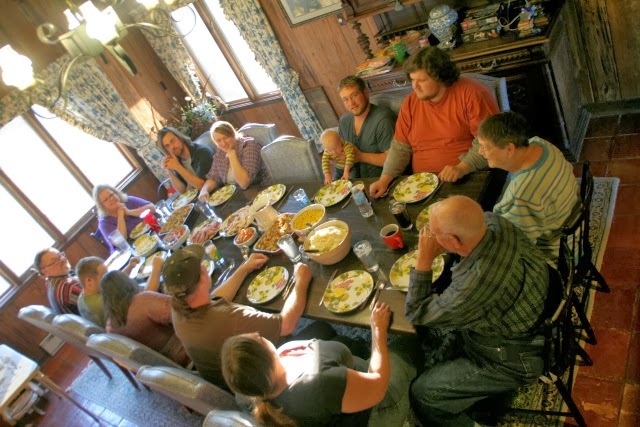 This entry last fall discussed the balancing act we find in regards to many aspects of our off grid life - our wood burning stove, propane water heater, etc.. This summer I have added experiments with another appliance that involves adjustments to get the temperature just right. I have finally started working with my Sun Oven, which is a solar powered oven. Basically a black box, with a tightly gasketed glass door surrounded by highly reflective panels. The sunlight is reflected from the panels into the oven to provide the heat. This may not sound impressive, but I can easily heat this up to 325 degrees just by sitting it in are yard. My first experiment was brownies, and I admit it was not the best choice to start with. There is a big difference between baking, such as breads, cookies and brownies and roasting. Baking is much more scientific and much less forgiving to any fluctuations.You just can't throw some ingredients together without a recipe, toss it in the oven at an unspecific temperature and expect it to come out as perfect cookies. Well, you can if you are my older daughter, but that is a different story... On the other hand, it is fun to throw together some ingredients for dinner, toss them in an oven and see what you end with. 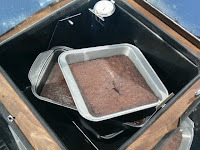 That said, my brownies turned out OK, but would have been better if I had baked them in the regular oven. So, until I get more proficient with the Sun Oven, I am focusing on creating slow-cooked meals in it as opposed to baked goods. I have made a great pot of baked beans that I took to a pot-luck and yesterday I threw a pot roast in a pan with new potatoes and carrots from our garden. I put in the Sun Oven for several hours while I worked around the house and ran some errands and last night we had a great pot roast meal with homemade sourdough bread. Note: I baked the sourdough bread in the regular stove the day before. 2. A High Efficiency Ceiling Fan. We have found a company that manufactures highly efficient 12v ceiling fans that use brushless motors. According to the specifications, this should be able to be integrated into our off-grid power grid without being a power hog. This will help with climate control both in the summer and winter. 3. A 12v Solar Powered Refrigerator. 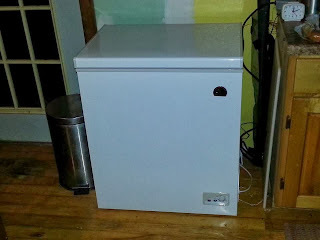 There are now 12v refrigerators that also use efficient brushless motors, and thus, can be powered using a solar electric system such as the one we have set up. While we are very please with how our propane fridge is working out, we would like to expand our self sufficiency in this area by eliminating the need to periodically purchase propane for refrigeration. Well, this blog post has certainly re-visted a lot of topics from the past year, but I do have one more Mulligan. You may recall a sad post last year when we had to put our very old dog to sleep because she was becoming too ill to have any quality of life. At that time, Alan and I made the decision to not get another dog. Well, meet Mulligan, she came walking up our driveway one day and apparently had not received the memo in regards to this decision. The fact that I fed her because she was skin and bones probably did not help persuade her to continue on her way. The dog that is not our dog, as I insist on calling her, had a collar with a broken link of chain attached to it. We posted we found her on Craig's List and also hung a sign at the end of our driveway, but based on her neglected condition, it seems she had been surviving on her own for quite some time. As we did not know her name, Alan started calling her Spot. At this point I still adamantly called her The Dog That's Not Our Dog. Our youngest daughter told Alan that Spot was a lame name, especially since the dog (that's not out dog) has no spots. She said Alan needed a do-over on her name, a mulligan. So, the dog that is not our dog is now called Mully (short for Mulligan). She sleeps behind our house, runs down the drive to greet us, and enjoys the food and dog biscuits we buy for her. She is also getting a do-over in life.